Emirates today announced it will introduce a third daily service to Brisbane, Australia, complementing Emirates’ existing two daily services. New service to be operated by B777-200LR from 1 December 2017. 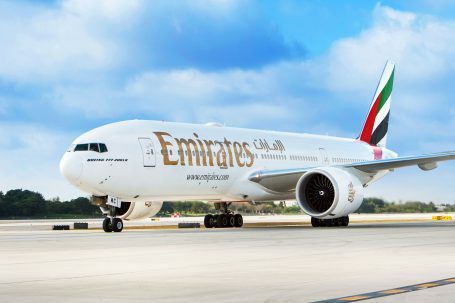 The direct service, to be operated on a B777-200LR aircraft with eight seats in First Class, 42 in Business Class and 216 in Economy Class, will increase capacity on the route by 3,724 seats a week, inbound and outbound between Brisbane and Emirates’ hub Dubai. This will give passengers in the United Kingdom, France and North America greater access to Australia with just one stop in Dubai as part of Emirates’ global route network, which includes over 150 destinations in more than 80 countries and territories. The inbound service EK430 will depart Dubai at 22:00hrs, arriving in Brisbane at 18:15hrs the following day. While the outbound flight EK431 will depart Brisbane at 22:25hrs, arriving in Dubai at 07:00hrs the following day. The service will operate alongside two existing daily services to Dubai. Flights EK434 and EK435 operate nonstop between Dubai and Brisbane and onwards to Auckland, New Zealand, while flights EK432 and EK433 operate between Dubai and Brisbane via Singapore. Additionally, with codeshare partner Qantas, Emirates offers services to Singapore twice daily from Brisbane. The news comes as Emirates announced it would be upgauging its third daily service to Melbourne from a B777-300ER to an A380 operation from 25 March 2018, allowing passengers to travel aboard Emirates’ A380 on all three daily flights between Melbourne and Dubai. Australia is a popular destination for international travellers with its diverse cities and coastal lifestyle. Brisbane is renowned for its thriving culture and is the major international gateway to the Gold Coast, a tourist hot spot and host of the Gold Coast 2018 Commonwealth Games. From a cargo perspective, the 777-200LR offers 14 tonnes of cargo capacity in the bellyhold. Popular goods expected to be transported on these services include fresh meat and vegetables, as well as pharmaceuticals. Emirates has something for the entire family as passengers can enjoy more than 2,500 channels of its award-winning inflight entertainment system ice. Passengers can also take advantage of onboard connectivity with its inflight Wi-Fi system. Emirates offers generous baggage allowances, with up to 35kg in Economy Class, 40kg in Business Class and 50kg in First Class. Emirates currently operates 77 flights a week to Australia from Dubai, with flights to Brisbane, Melbourne, Perth, Adelaide and Sydney. The addition of this service will bring this number, including Qantas operated flights, to 98 flights per week to Australia from Dubai. For more information on Emirates visit www.emirates.cz.